Astronomy Picture of the Day and archives of all previous APODs. AstroWeb a database of more than 2000 astronomical resources. Historical astronomy and picture galleries probably will be the most interesting parts of the site for general users. History of Astronomy Page has more than 400 pages with over 8,000 links on persons, issues, topics and many other categories. Coverage is worldwide and includes early astronomy of non-Western cultures. Aurora Website from the Geophysical Institute, University of Alaska, Fairbanks, includes striking images, educational materials and aurora forecasts. 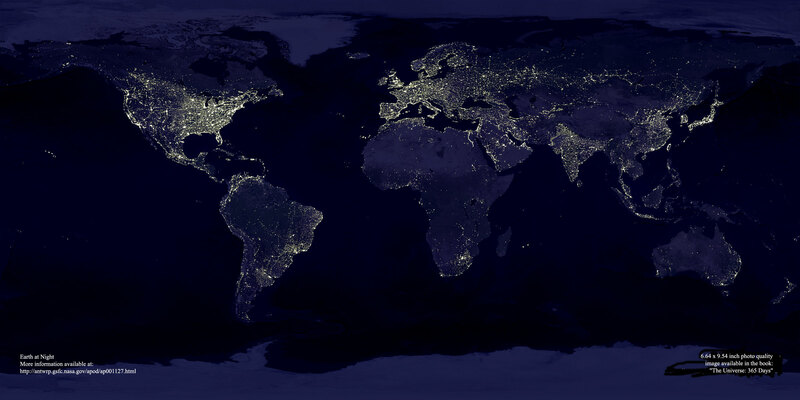 NASA's "Earth at Night" an astronomy image of the day selection from their main page. Virtual Tour of the Nine Planets. Photos of every planet and every possible moon and object in the Solar System. Useful text and lots of links. USGS Gazetteer of Planetary Nomenclature helps you find official locations and names for craters, mountains and other surface feature on our neighboring planets. Views of the Solar System. Derived from NASA data, this site has flyovers of the other planets and a lot of information about our nearest neighbors in space. The Solar System Simulator from NASA's Jet Propulsion Laboratory in Pasadena, California. Shows the location and apparent phase of any of the 32 planets and moons from any of the others on any date. NASA movie clips let you watch everything from the famous golf shot to more serious moments in US space history. Planetary Photo Journal has pictures of planets and smaller stuff in our solar system. Chicago's Adler Planetarium. Interactive tours of the Solar System and the Milky Way Galaxy online. How much do you weigh on other planets? Click here to find out. Solar System Live maps of our neighborhood and lots of handy information. An Earth and Moon viewer which lets you make custom images and more. Very cool and has good instructions. Scale model of the solar system in Presque Isle, Maine. The 40 miles from the interstate to the University of Maine represents the astronomical units separating the Sun and Pluto. Scale models of the planets are being hung in roadside fields. Impact craters from the Natural Resources Canada database. Meteors Organization and NASA's Leonid page have meteor watching tips. Internet Campus - Terrestrial Impact Craters. Pictures and descriptions. Throw an asteroid from anywhere to anywhere. Thanks to "Quick Takes" by Zay N. Smith (June 8, 2000) for this chance to wipe out other planets with stray rocks. Asteroid and Comet Impact Hazards site tracks near Earth objects and hopes to find 80 percent or so by 2008. See the future or visit their list of incoming rocks. Sky diary charts of astronomical events by month come as .pdf downloads and are just fabulous resources for skywatching. Download sky maps each month, then print them out and learn your stars! Astronomical Society of the Pacific provides astronomical information both general and specific to Hawaii. Hawaii Astronomical Society site about constellations and deepsky objects. Will print out sky maps for any latitude from 45 south to 45 north. Works on both Windows and Macintosh. Hawaii's Bishop Museum Planetarium page provides rise/set and sky charts for all the islands and other fascinating astronomical information. Griffiths Observatory Sky Information Page. Eclipses, planets, online orrery, meteors, watching artificial satelites, the 13 houses of the zodiac and more. Skywatching from Earth and Sky radio series lets you click on the day of the month to see the sky for each night. The site is easy to use, with great explanations and interesting side topics. Constellation Mythology from the Legg Midle School Planetarium's award winning site. Also has star maps and great stuff for teachers. Sun and Moon rise and set times. My links to sites about phases of Earth's moon. Online ephemeris for the sun and moon from NASA's Goddard Space Center. Official U.S. time. Click on your timezone and watch the Java clock tick. Also has a great day/night timezone diagram showing our shadow slowly moving across Earth. Sunclock shows light and shadow on Earth's surface. An interesting sunclock which shows sun/shadow line and timezones worldwide. Sundials on the Internet provides information on many kinds of sundials and worldwide links. The History of Sundials from the Royal New Zealand Institute of Horticulture. Solar noon calculator for anywhere on Earth. Solar noon sundial with instant setup instructions. Analemmas. Not just a funny figure eight out in the Pacific Ocean anymore. Make one at home or enjoy the images at this site. If you have an analemma for each month for your location, your sundial will always be accurate! Learning Technologies Inc. sells near cost astronomy teaching supplies including the pocket spectroscope so admired by my NEIU and TCC students. Sky and Telescope Magazine has an interesting "tie-in" website for their publication. Center for Archaeoastronomy publishes a journal on the topic as well as providing web links to responsible sites about this fascinating topic.